“This is eight episodes of setting up the amazing Neil Gaiman world of American Gods and following the story of the old Gods and the new Gods. I’m one of the old Gods. New Gods are obviously technology and media and we look at the things we worship, what we worship and why we choose to do it. So it’s an exciting show to do at this particular time.” said cast member Orlando Jones. 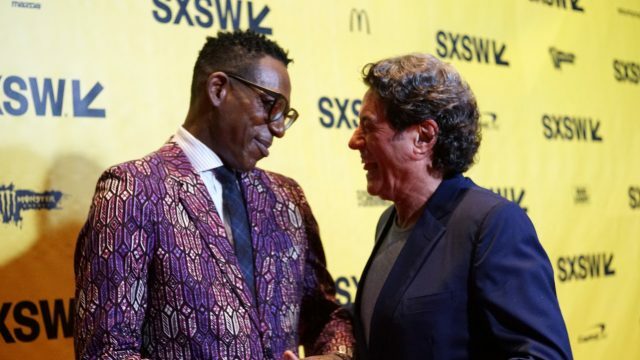 If you missed the SXSW world premiere of American Gods, which took place at the Vimeo Theater on Saturday, March 11, you can now watch the first episode of the television series on Sunday, April 30 at 9pm/8c on STARZ. Adapted from Neil Gaiman’s award-winning novel, American Gods follows Shadow Moon (Ricky Whittle) and Mr. Wednesday (Ian McShane) in a hidden world where a battle is brewing between Old Gods and New. Bryan Fuller and Michael Green serve as showrunners. The pilot episode is directed by David Slade whose work includes the films Hard Candy, the third film in the Twilight series, The Twilight Saga: Eclipse, and the a vampire horror 30 Days of Night. Slade has also directed several television pilots including NBC’s Hannibal, as well as an episode of AMC’s award-winning Breaking Bad. American Gods features an ensemble cast consisting of Ricky Whittle, Ian McShane, Emily Browning, Pablo Schreiber, Crispin Glover, Yetide Badaki, Bruce Langley, Orlando Jones, Jonathan Tucker, and Betty Gilpin.